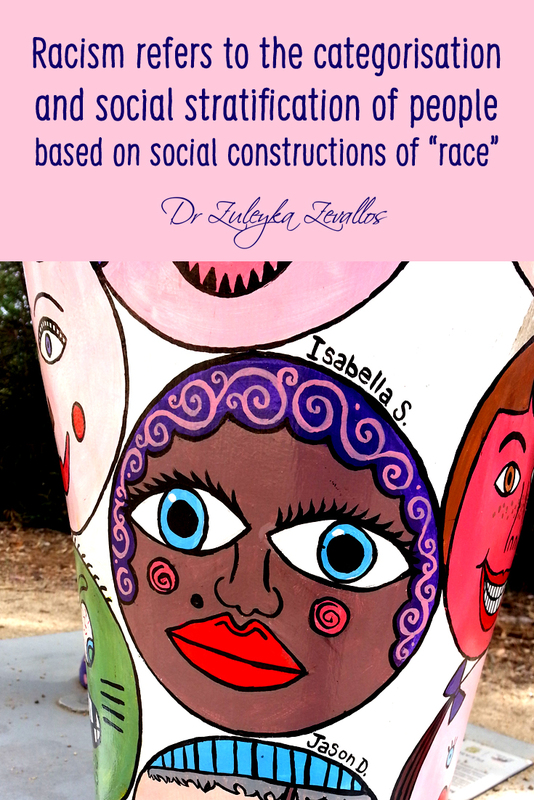 Racism refers to the categorisation and social stratification of people based on social constructions of ‘race’. There are three definitions of racism that are generally studied in sociology: individual, institutional and everyday racism. First, racism can be defined at the individual level, and this refers to the way individual people express racist ideals. Under this model, individuals are either racist or ‘not racist’, and racist ideas are articulated as a conscious ‘set of organised beliefs’, values or attitudes about racial difference (Jenkins 1997: 83). Second, racism can be defined at the institutional level, where racial categories are based less on individual and consciously held beliefs, but more on the institutional processes that systematically discriminate against racial categories of people. In this sense, racism is more wide-ranging than deliberate individual acts of racial intolerance, and so, ‘racism involves categorisation on the basis of any set of criteria which will allow difference to be asserted’, including religious as well as cultural intolerance (Jenkins 1997: 83). Third, Essed identified everyday racism, a concept that is critical of the individual and institutional theories on racism and the distinctions between them. Everyday racism examines individuals’ lived experiences and knowledge of racism, and it connects structural forces of racism with routine situations in everyday life. It links ideological dimensions of racism with daily attitudes and interprets the reproduction of racism in terms of the experience of it in everyday life (Essed 2002: 177). Essed saw that the power dynamics of racism were socially reproduced in taken-for granted ways, even when people were unaware of it, through the repetitive or familiar practices of everyday situations (Essed 2002: 190). My paper takes its impetus from Essed’s work. My examination of everyday racism refers to the social experiences of second generation migrants in three ways: the question ‘where are you from?’, the ‘wog’ identity, and my participants’ understandings of racist practices in Australian society. These three constructs can be seen as examples of everyday racism because they are constructed through everyday social exchanges that reinforce exclusionary and racist constructions of Australian identity. First, Ang argued that the ‘apparently innocent’ question of ‘where are you from?’ may not be intended to be racist, but the ubiquity of this question in everyday social interaction positions ethnically and racially marked Australians as ‘other’ (Ang,1996: 43). In a previous study, I found that the question ‘where are you from?’ entrenched my participants’ feeling of social exclusion from Australian identity. People assumed the women I interviewed were not Australian when they asked this question, and in reaction the women would say, ‘Well I’m not going to think of myself as Australian’ (Zevallos 2003: 89). Second, while second generation migrants have actively embraced the ‘wog’ identity in their everyday social practices, such in their construction of a ‘wog community’ (Zissiadis 2004) and their reworking of Australian English (Warren 1999), this identity exists as a reminder of the limitations of multiculturalism’s anti-racist strategies (cf. Perera and Pugliese 1998). Third, although the second generation tend to describe Australian national identity in terms of its multiculturalism, they nevertheless experience a sense of marginalisation, especially due to cultural representations of this identity in terms of ‘Anglo-ness’ and their everyday social experiences of racism (for example see Poynting, Noble and Tabar 1998; Zevallos 2003). During September 2001 and April 2003, I conducted in-depth, semi-structured interviews with 50 second-generation migrant women aged seventeen to 28 years. The women came from two groups: first, I interviewed 25 women of Turkish background, and second, I interviewed 25 women of Spanish-speaking South and Central American background. The interviews were tape-recorded and transcribed verbatim, and the participants were given pseudonyms. I asked the women three general questions regarding racism, and further probing questions about their stories: ‘Did you ever come across anything negative while you were growing up because you were of [participant’s ethnic] background?’; ‘have you ever experienced any racism or discrimination? ; and, ‘when you think about Australian society as a whole, do you think Australia is a fairly tolerant or a racist society?’ My analysis considers the relationship between subjective understandings of racism and constructions of the ‘Australian identity’ using the concept of everyday racism. The participants understood racism as it is defined by the concept of individual racism, rather than in terms of institutional or everyday racism. They described racism in reference to overt or explicit statements or actions of hatred, abuse and discrimination by specific individuals towards ethnic minorities due to their physical attributes, their cultural and religious practices, and their beliefs. Most commonly, the women cited incidents of verbal abuse as ‘racism’, such as being called a wog or being told to ‘go home’. In the most extreme cases, the women described being refused service by taxi drivers and shop assistants, police arassment, continuing incidents of discrimination in their workplaces, and one woman described a physical act of racism, when a man yelled obscenities at her and spat on her face while she walked down the street. The first example of racism I consider is the question ‘where are you from?’. Whenever I asked the women to describe their ethnic identities or when I asked them if they felt other people accepted them as Australian, they would make reference to the question, ‘Where are you from?’, without any prompt from me. A couple of the women said they tried not to ask this because the question annoys them, but all the women nevertheless asked this question out of ‘curiosity’, and they felt that most people did so out of the same sense of curiosity, rather than from a sense of racial intolerance. For example, Aylin expressed dislike of this question but she said, ‘Sometimes you can’t help it because you start talking about countries… [or] you just want to know where their features are from’ [Latin]. Most women saw the question ‘where are you from?’ as simultaneously frustrating and compelling. This question was not seen as a manifestation of racism, even though it made them feel as if they were not seen as Australian. This is interesting, because the women felt that people who did not accept them as Australian were ‘racist’. Instead, the question ‘where are you from?’ was only read as ‘racist’ in reference to the way in which it is asked, especially if it was asked in a nasty fashion, which points to an issue of social etiquette rather than racism. It is the women’s reading of the sentiment and the appropriateness of the person using the word ‘wog’ that makes it a racist act. That is, the participants construed the term wog as racist when an Anglo-Australian person uses it, but where other people of NESB migrant backgrounds referred to migrants this way, no offence was taken. Most of the women referred to themselves as wogs, and a couple of the Turkish women jokingly referred to other Turkish people who were heavily focused on cultural traditions as ‘wog-Turks’. The appropriation of the term wog among people who are seen as wogs is an act of defiance and empowerment because it celebrates their cultural difference (Zissiadis 2004). The Latin women sometimes referred to themselves as wogs, but at the same time, they would tell me how Latin people were not ‘really’ wogs because only migrants of European background were wogs. In several stages of her interview, Claudia referred to herself as a wog, but when I asked her how she felt about the term wog her answer reflected the ambivalence the Latin women had towards seeing themselves as wogs. Does that word bother you? Claudia: “Wog”? No. I know it bothers other people and that’s why I know if it bothers others, that’s why I do that [draws air quotations with her fingers]. I don’t think I am, because I’ve always thought that wogs were European people and I always say “I’m Latin, I am Latin. I’m not a wog”. I’m from the Latin side, not from the Europe side. I don’t think it sounds like a nice word to use for people, even if I was called that I’d be offended, depending on how a person uses the word [my emphasis, Latin]. ‘I was seen as an Aussie over there [Uruguay], but here I don’t think I am. I’m always seen as [laughs and drops her voice] as a wog. I think that you can tell because of the dark hair’[Latin]. Here, Claudia noted how racial markers, namely her dark hair, immediately marked her as a wog and therefore as a ‘non-Australian’. Although the women actively constructed – and ambivalently embraced – the wog identity, this identity is best understood in terms of everyday racism. Thinking of oneself as a wog and being thought of as a wog by others involves everyday practices that result in a reproduction of racist constructions of national belonging. Looking like a ‘non-Anglo’ is set up against looking like an ‘Aussie’, and in these women’s experiences, wogs are not seen as Aussies. Amatullah’s comment is typical of the sample: Australia is not a racist society because ‘it is a multicultural society’, and people who were in denial about the fact that Australia is multicultural embodied racism. 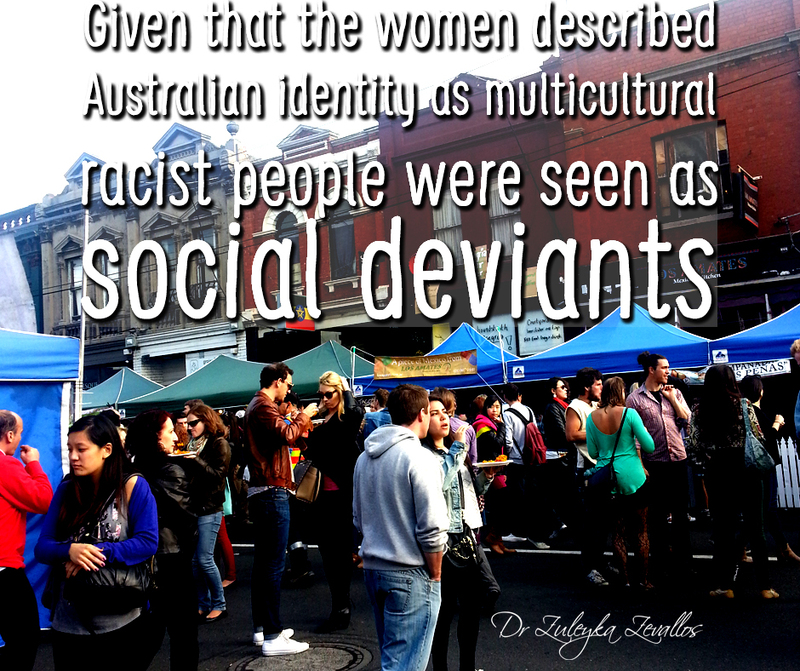 Given that the women described Australian identity as multicultural, racist people were seen as social deviants. In the above example, we see that Solmaz felt justified in retaliating against racism because of Australia’s multiculturalism. As she saw it, the man had no right to be racist because of three interconnected beliefs regarding multiculturalism: first, living ‘in a multicultural society’ required tolerance of cultural difference; second, without the multiculturalism that migrants created, Australia would have no identity (and so here, Anglo-Australian culture was not seen as a contributor to multiculturalism); and third, the man had no more or less of a legitimate claim over the Australian identity than she did because he was not an Indigenous Australian. Racism, we can see in this example, was embodied through individual people who betrayed the multicultural spirit of Australia. The women’s understanding of Australian multiculturalism seemed to drown out their experiences of racism: in a multicultural society, there should be no racism, and so the racism they experienced must have been the product of a few deviants who had the audacity to deny our multiculturalism. The women did not connect their personal experiences of racism to a pervasive problem of racism in Australian society, no matter how deeply this racism had affected them. On the whole, the women I interviewed did not define racism as institutional or as everyday racism; instead, most women defined racism through individual processes. That is, they believed racism operated through individuals who were racist, rather than through structural racism. While social exclusion from Australian identity was constructed as a form of racism, commonplace social exchanges that the women collectively shared, such as the question ‘where are you from?’, the wog identity, and their social experiences of racism, were not seen as straightforward examples of racism. In part, this was because the women I interviewed actively participated in the making of the wog identity and in asking about other people’s ethnic/cultural origin, both of which are discursive practices that relate to the construction of ‘race’. It was positive for the women to create a sense of solidarity through a shared sense of ‘woginess’ and to satisfy their curiosity about someone’s migrant background. In this sense, establishing difference was empowering. Being excluded from Australian identity due to difference, however, was not experienced positively, but unless this exclusion occurred in a context of inter-personal abuse, it was not understood as an act of racism. 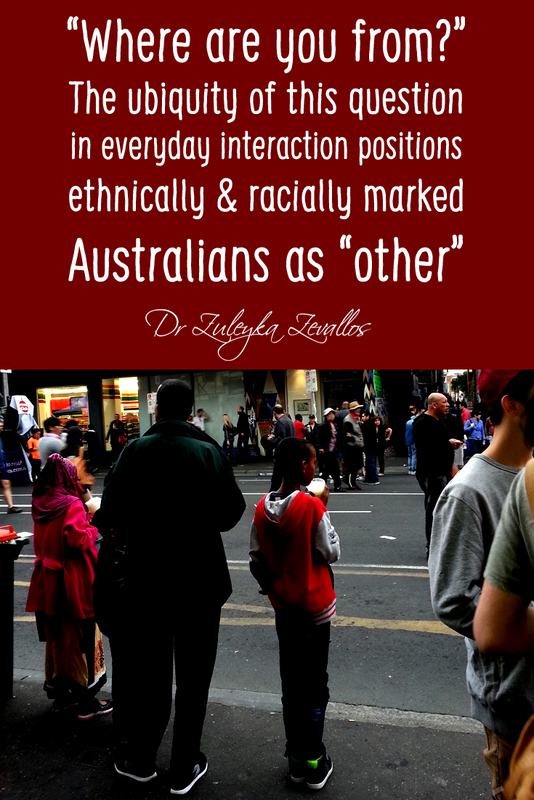 The social interaction regarding the question ‘where are you from?’, the wog identity, and the women’s social encounters with racism are best understood through the concept of everyday racism. Everyday racism makes visible the ways in which racist ideas are socially reproduced in taken-for-granted ways through familiar everyday situations. Even though the women I interviewed and the people they interacted with did not always recognise or intend a connection between their everyday exchanges and racist practices, the three examples I discussed were prolific in the interviews I conducted. I argue that these are not merely examples of racism at the individual level, and instead, that these examples indicate a pattern of societal practices that warrant critical discussion. Ang, I. (1996) ‘The Curse of the Smile: Ambivalence and the “Asian” Woman in Australian Multiculturalism’, Feminist Review 52: 36–49. Essed, P. (2002) ‘Everyday racism: a new approach to the study of racism’, pp. 176-194 in P. Essed and D. T. Goldberg (eds) Race Critical Theories: Text and Context. Massachusetts: Blackwell Publishers. Jenkins, R. (1997) Rethinking Ethnicity: Arguments and Explorations. London: Sage Publications. Perera, S. and J. Pugliese (1998) ‘Wogface, Anglo-drag, contested Aboriginalities… making and unmaking identities in Australia’, Social Identities 4(1): 39-72. Poynting, S., G. Noble, and P. Tabar (1998) ‘“If anyone called me a wog, they wouldn’t be speaking to me alone”: protest masculinity and Lebanese youth in western Sydney’, Journal of Interdisciplinary Gender Studies 3(2): 76-94. Warren, J. (1999) ‘“Wogspeak”: Transformations of Australian English’, Journal of Australian Studies 62: 86-94. Zevallos, Z. (2003) ‘“That’s my Australian side”: The ethnicity, gender and sexuality of young women of South and Central American origin’, Journal of Sociology 39(1): 81-98. Zissiadis, C. (2004) ‘What is a wog?’, Woglife 26 April. Accessed online http://www.wog.com.au/article_main.asp?ArticleId=416 last accessed 13 July 2004. The published version of this article can be accessed as a PDF free from the publisher via the link below.